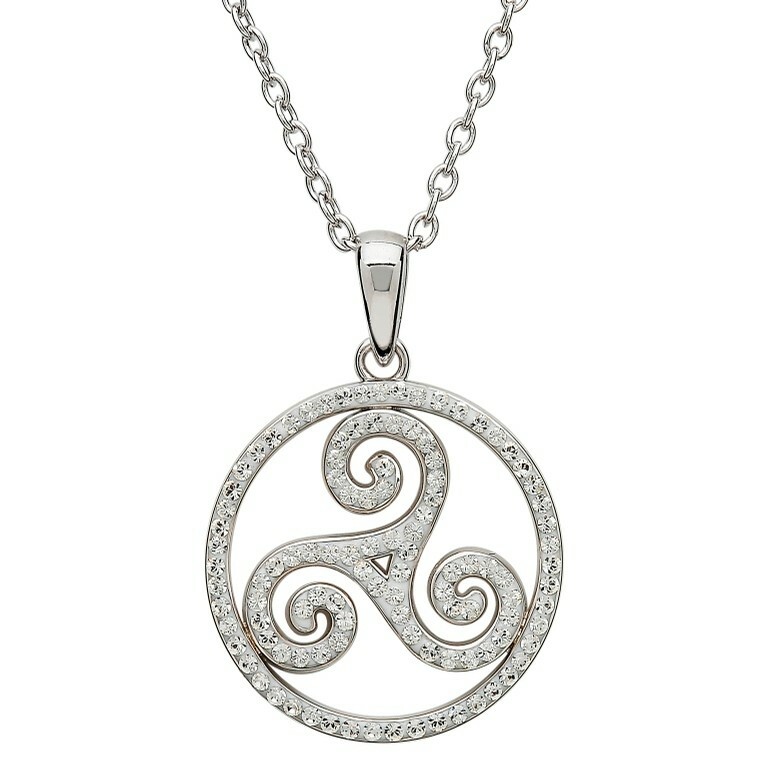 Brilliant, bright white Swarovski® crystals shine on this silver Celtic Swirl necklace. Elegant design and stunning detail come together to create a winning look. The Celtic swirl so elegantly featured on this sterling silver pendant is a nod to designs discovered in historic Celtic megaliths found at Newgrange, Co. Meath. Newgrange being a prehistoric site in Ireland that has lent its discoveries to a breadth of artistic and historic contributions in Celtic culture. The images feature three turns in the swirl, meant to represent three worlds: land, sea, and sky. They can also be interpreted through spiritual and religious associations - past, present and future, or The Holy Trinity. This three sectioned style is a common theme found in Celtic imagery. In this particular necklace we see a unique interpretation of this beautiful and meaningful symbol. The design is made even more special with the addition of sparkling white Swarovski crystals. These beautiful crystal stones are set in a pretty, white acrylic setting within the carefully crafted sterling silver pendant, and fully encompass the pendant. Promote your Celtic pride and showcase your eye for beauty by styling this exquisite piece into your wardrobe. The sleek sterling silver framework and the beautiful crystals make this a day to night piece. Truly a must have. Measures: 3/4 inch on an 18 inch Sterling Silver Belcher, Bolt Ring Catch. This piece is not discontinued so when our stock is sold we cannot reorder.